Following on from last night’s FU Friday Flip tournament, there was more fun to be had today at Lex Live in Namur. Saturday afternoon saw Lex Veldhuis and his Twitch community take over the amazing Barnabeer bar in the city centre for a good old fashioned pub quiz. In this quiz, though, there was only one subject. How well did his community really know the man they’ve spent hours railing, supporting, and interacting with? This was the best way to find out, and trust us when we tell you, these guys came prepared. When it comes to the man himself, nobody knows Veldhuis better than his mother, who was in attendance. Veldhuis’s fiancee Myrthe was also taking part. Benjamin “Spraggy” Spragg, Fintan “EasyWithAces” Hand, and Felix “xflixx” Schneiders were all in the house too, testing their knowledge. But in a way, they’d already won. You see, midway through the quiz Veldhuis announced that the four players with the highest quiz score would be taking part in a private sit and go tomorrow, streamed live on Veldhuis’s Twitch channel. The event will be a tag-team tournament, with each winner paired up with one of the PokerStars Ambassadors. They can sub in and out whenever they wish. Those four will be paired up with either Lex, Spraggy, Fintan or Felix tomorrow in a draw tomorrow. Players five through eight received a goodie bag for their efforts. Are you ready to take the quiz yourself? Then grab a pen and paper and get comfortable! 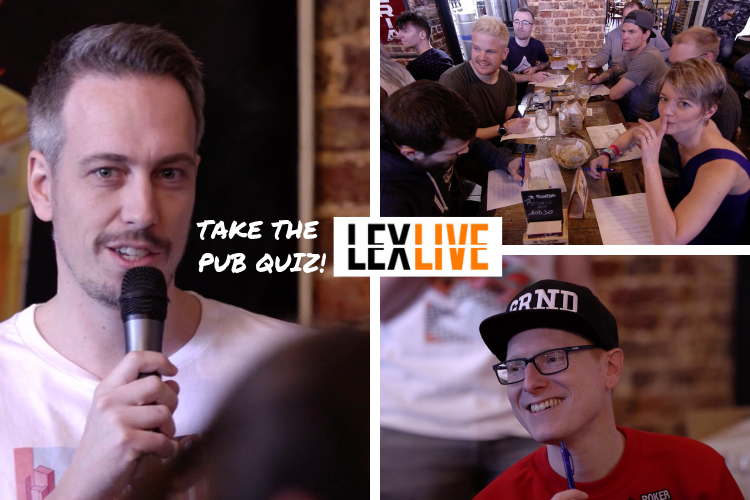 TAKE THE LEX LIVE PUB QUIZ! Jot down your answers as you scroll through the quiz. You’ll find the answers at the end. Good luck! 1) When is Lex’s birthday? 2) What was Lex’s biggest score on Twitch and how much did he cash for? 3) Everyone knows him as Lex, but what is his real first name? 4) What was Lex’s longest stream (in hours)? 5) What date did Croaks become mod? 6) When was Lex’s first stream? 7) How many years has Lex been part of Team PokerStars? 8) How many countries has Lex streamed from, not counting IRL? 9) How many subs did Lex peak at? 10) What’s Lex’s daily sub record? 1) Lex is part of Team liquid, what game did he play? 2) Who was Lex’s first sub? 3) What’s Lex’s Final Table song (Artist + title)? 4) Lex doesn’t smoke weed these days. What’s the only thing he smokes? 5) How many ball fail clips are there? 6) Which member of Team PokerStars (past or present) did Lex teach poker to? 7) What did Lex do for 1,000 subs? 8) What is Lex’s biggest online score apart from Twitch? 9) How many labels does Lex have? 10) What is Lex’s favourite movie? 1) What’s Lex’s fiancee’s first name? 2) How old is Lex? 3) What is Lex’s favourite beer? 4) What kind of car does Lex drive (colour + brand)? 5) Which PokerStars tournament was called the “Lex Veldhuis Open”? 6) Which Dutch football player do people say Lex looks similar to? 7) Which Twitch Streamer does Lex watch the most? 8) What is Lex’s favourite Dota Hero? 9) What’s the correct amount of big blinds to raise to with A8 offsuit? 10) What game does Ruthann really want Lex to play, but secretly he’ll never finish? 1) Who is the fastest Mod on Twitch? 2) Who is Lex’s personal poker coach? 3) How many steps does Lex walk a day on his treadmill? 4) Who is better at Dota, Spraggy or Lex? 5) What was Eklusis’s name on Twitch before Eklusis? 6) In what city did Lex propose to Myrthe? 7) What’s the best sauce on steak? 8) What’s Lex’s favourite SNES game? 9) What’s the most kills Lex has got in a win on H1z1 on stream? 10) What’s the buy-in of the first tournament Lex ever won on stream? 1) Does extemp_re have an O or 0 in his name? 2) How many 6’s are in “mpadam”‘s Twitch name: 2 or 3? 3) Who edits Lex’s YouTube videos? 4) What did Lex do for reaching 500 subs the first time? 5) The faster you run from me…? 6) What Mini Game did Lex use to play on breaks? 7) What tournament did Lex call the “daily donation” when he was playing in Canada? 8) How many seconds are on the countdown in the last scene of Lex’s intro scene? 9) What’s Lex’s biggest live tournament score? 10) What hand did Lex call Doyle with on High Stakes Poker? 1) What’s Lex’s lowest tier donation song? 2) What’s the most Final Table’s Lex has ever got in one stream? 3) What is Lex’s gamer tag (get the spelling right!)? 4) Which three trolls from Lex’s viewers did a birthday video for him in 2017? 5) Who’s the bodybuilder in the motivation videos Lex used to watch? 6) What scares Lex the most? 7) Who is Lex’s favourite player on the triton episodes? 8) Name three players that Lex has tagged as “legend” on PokerStars? 9) What’s the first video on lex’s Youtube, that is NOT a guitar hero gameplay? 10) What was the most amount of bounties Lex has won while playing the $7.50BB all in every hand? Tweet your results to us at @PokerStarsBlog, and make sure you tag @RaSZi too!